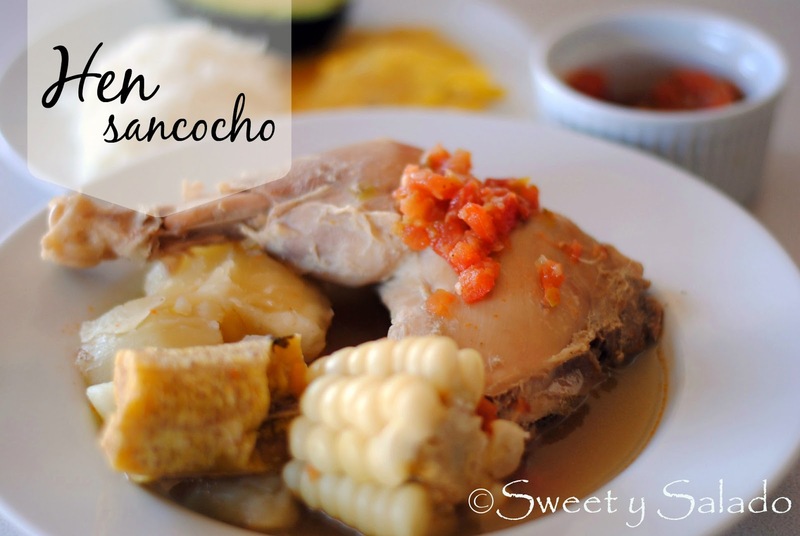 Just like tamales, there are many different types of sancocho in Colombia depending on the region, and hen sancocho is one of the most popular. This recipe has been requested many times and I’m surprised why I didn’t post it earlier. But I have two reasons. The main reason is because finding a hen where I live is not very common, I wouldn’t say rare because you can find them frozen every now and then, but it’s not easy. The second reason is because I’m not a big fan of this dish. In the beef short rib sancocho recipe I told you that I didn’t like making it because for some reason I don’t like the way hen tastes, I’m not sure what it is, but I just don’t like it. I do make it at home every now and then because my husband loves it, mainly because he’s from Valle del Cauca which is where this recipe is originally from. Every time I say I’m going to make it, he gets really excited. And of course, I’m one of the few Colombians who doesn’t enjoy a big bowl of this hen sancocho, you can ask anyone else how they feel about it and they will tell you how delicious it is. I do want to point out that you don’t have to make it with hen, you can also make it with chicken if that is all you can find. The flavor is very similar but hen has a stronger “chicken” flavor and it has to be cooked longer because it has a tougher meat. Another reason why Colombians love to make it with hen is because many times the hens that you buy down there still have some eggs inside, the eggs are cooked in the sancocho as well and from what I hear, they’re delicious. Yeah, food for thought. 1. Pour water into a large pot. Add the white onion, scallions, cilantro, garlic and hen pieces. Cover and bring to a boil on high heat. Once it’s boiling, reduce heat to medium low and cook for about 1.5 hour. If you’re using chicken, cook for about 45 minutes. 2. Remove the cilantro, onion and scallions from the stock. 3. 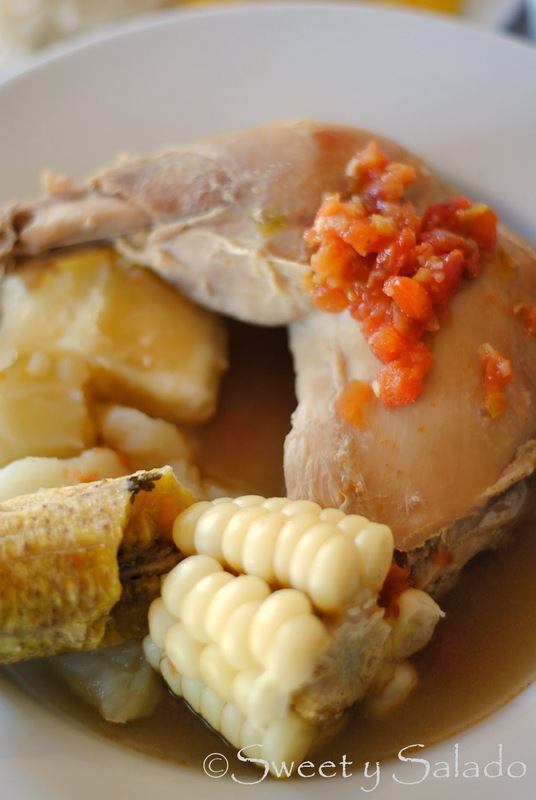 Add the potatoes, cassava, plantains, corn, hogao, aliños, chicken bouillon and season with salt and pepper. Add more water to the stock, if needed. Stir well. 4. Cover and bring to a boil once again on high heat, then reduce to medium low and cook for about 35 minutes or until the vegetables are tender. 5. Skim off the fat that is on the surface as much as you can with a spoon. Check for seasosing and add more salt and pepper, if needed. 6. Serve immediately with a side of white rice, avocado, patacones and more hogao. Garnish with chopped cilantro.